One of my favorite quotes is attributed to many. I think this wisdom is timeless. “We compare our insides to other people’s outsides”. And that is never more true in the era of social media, where sometimes the most unhappy people can convince themselves and others that they are happy, successful and without a care in the world. We’ve all seen it. Just look on Facebook, Snapchat, Twitter, Vine, Instagram… take your pick! …here’s the thing to remember. They are only showing you what THEY want you to see. So don’t view their posts as their life. They aren’t going to write “came home, had three drinks, drove carpool, stopped at Dairy Queen for a blizzard before dinner, and slapped my husband when he came home late because I know he’s seeing someone”. STOP COMPARING. Because it’s like comparing apples to a screwdriver — not even remotely related! 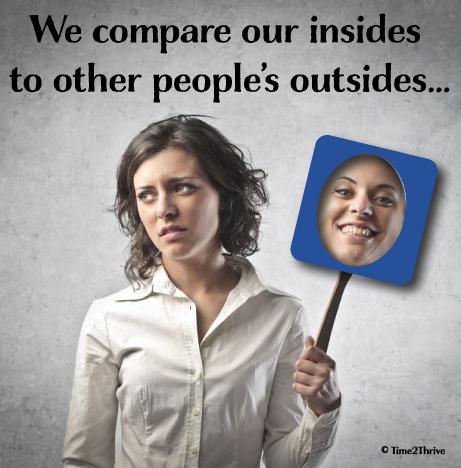 You are comparing your inner thoughts, often full of self doubt, questions, and insecurity (read = NORMAL) to someone else’s made up and carefully crafted “what I want the world to see about me”. Keep that thought in your mind the next time you compare yourself to somebody else’s wall… And remember a wall is often built to keep things locked away from sight.